Our top-priority is keeping Signal Hill, Sienna Hills, Signal Ridge residents informed. All the community’s must-know news is easily accessible through the Signal Hill, Sienna Hills, Signal Ridge community newsletter, which is published monthly so that residents are kept current on relevant community and Calgary news. 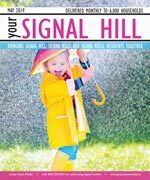 Your Signal Hill is delivered monthly to every household, apartment, and business, and is a great way to get hyper local advertising exposure. A Signal Hill Community Association (SHCA) membership supports the activities of our community. The Signal Hill Community Association liaisons with other groups which provide services for the community. SHCA brings concerns of the community forward and helps support new initiatives that benefit the people in our community. The Community associations is a neighbourhood-based volunteer organization, that provides a voice for community life, an overall sense of belonging, and social, educational and recreational opportunities for their residents. Everyone is welcome to attend the monthly meetings, and particularly the annual general meeting, where many community members purchase or renew their Community Association Memberships. In the City of Calgary's 2012 municipal census, Signal Hill had a population of 13,914 living in 5,253 dwellings, a 0.9% increase from its 2011 population of 13,795. With a land area of 5.6 km2 (2.2 sq mi), it had a population density of 2,485/km2 (6,440/sq mi) in 2012. Signal Hill is a wealthy neighborhood, with the median household income of $133,844 (2011). The wealthier residents ($200,000- $400,000 median household income) live in Upper Signal hill, which is located on the top of the hill, above the first few rows of houses which are locate above the famous Signal Hill numbers. As of 2006, 4% of the residents were immigrants. For more detailed info visit the City of Calgary community profiles site.